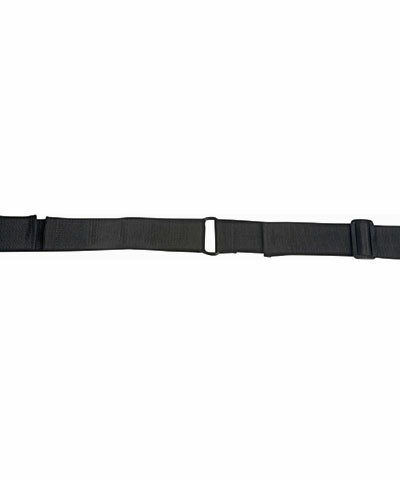 This accessory is a two piece chest strap, 1 ½" webbing, with a D-ring/Velcro closure. Tri-Glides are woven on the straps for tension adjustability. At the ends of the straps are easy to install belt anchors. One side of the strap is placed in front of the client and passed through the d-ring on the other strap and brought back upon itself and secured via velcro. This accessory is beneficial for the client who needs support to keep them back in the chair. The belts can be installed on lateral supports, the solid back, or the wheelchair frame. The BioForm Non-Stretch Chest Positioning Belts are available in 1½ " and 2 " webbing widths. Both come with d-ring and velcro closure to allow for greater leverage when tightening. One side of the strap is placed in front of the client and passed through the d-ring on the other strap and brought back upon itself and secured via velcro. Positioning Belts have tri-glides for easy adjustment and end fittings for convenient mounting. A padded Chest Positioning Belt can be created by adding one of the padded sleeve options.